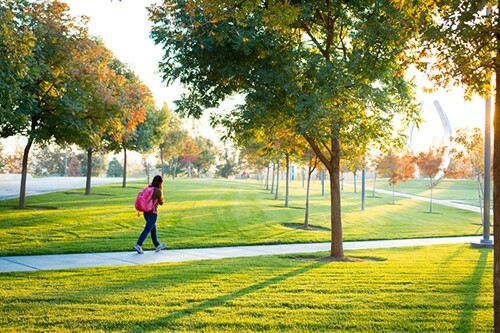 Don’t be surprised if, as the warmer weather kicks in, you continue to see green lawns at UC Merced. Maintenance crews are not using more water to keep the quad lush. In fact, they are using less. Facilities Management has adopted a hydrogel system, developed by a Fresno-based company, that allows turf to stay green despite a lack of water. “It’s going to look like we are not observing the drought, but we are,” Sustainability Director Colleen McCormick said. Tests show that the hydrogel system uses almost 50 percent less water because it increases soil’s moisture-retention capabilities. The hydrogel acts as a water and nutrient reservoir, allowing a slow release into the soil and roots. It was chosen for its savings, but also because it is environmentally sound, senior engineer for Facilities Management Jim Brugger said. It lasts a long time and is nontoxic and biodegradable. The hydrogels have been deployed in The Bowl, the amphitheater, the soccer field and the quad. Other areas of campus are, as last year, going to be left to dry out when the summer heat comes, as the campus wants to continue exceeding state water-conservation requirements. The campus, which constructed all of its buildings to be 40 percent more water efficient than state requirements, has so far been able to trim another 25 percent of its water consumption from the baseline year of 2013, despite the addition of two new buildings and 1,000 more students since then. The campus employs a number of other strategies to help save water, and, as a byproduct, energy. Those efforts include: not watering some lawns; using an evapotranspiration-based irrigation system that senses weather and moisture and waters only when appropriate; reducing those watering times by 28 percent; using sprinkler heads with more directed streams instead of wide sprays, to reduce waste; being vigilant about repairs that can mitigate leaks, reduce or eliminate runoff, and improve irrigation efficiency; using low-flow hardware in housing; and many others. When school is in session, Facilities counts on campus users to help UC Merced continue saving water, as well. Each year, on-campus residents take part in a water conservation battle. There are nearly 15 hydration stations around campus now where people can refill water bottles and thermal cups rather than buying more bottles. Campus community members are urged to conserve, despite the wet winter the state enjoyed.